Here is my video inspiration for this post. Make sure you press play while you enjoy the post. FYI: this is my FAVORITE movie EVA! Check baby Check baby 1.2.3.4. Check baby Check baby 1.2.3. I had so much fun creating this project in my head. See I had these mini blue jeans from my son when he was LIL. I didn’t want to throw them away or stuff them into a box so I decided to let my creative brain decide for me. 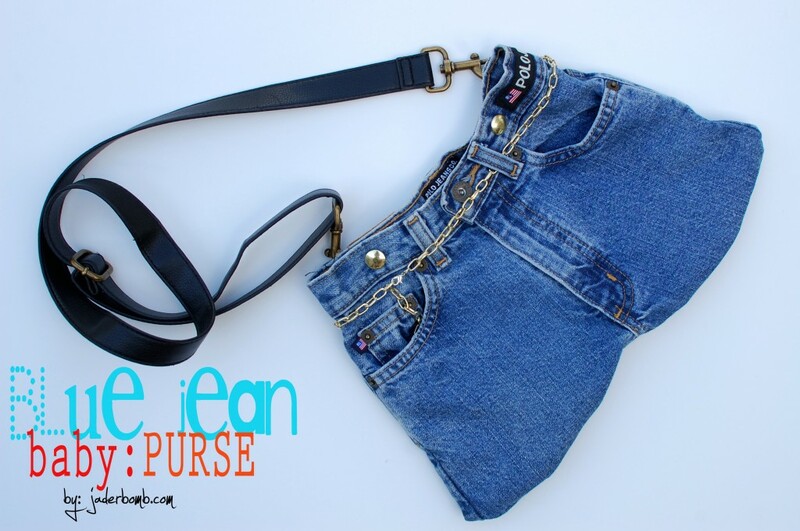 I thought they best way to incorporate them into my daily life was to make them into a fashionable blue jean purse. Let’s get started. I’m just warning you, this craft is super easy so put your crafty seat belt on. I know, I know. You are prolly thinking “Hey Jaderbomb, where is your “ingredient” list”. If you don’t know what that means it’s the picture of things you will need to make this project. I will tell you why I don’t have one. Well, because I didn’t plan on posting this. I think I THOUGHT it wasn’t going to come out like it did in my head. I guess I fooled myself. 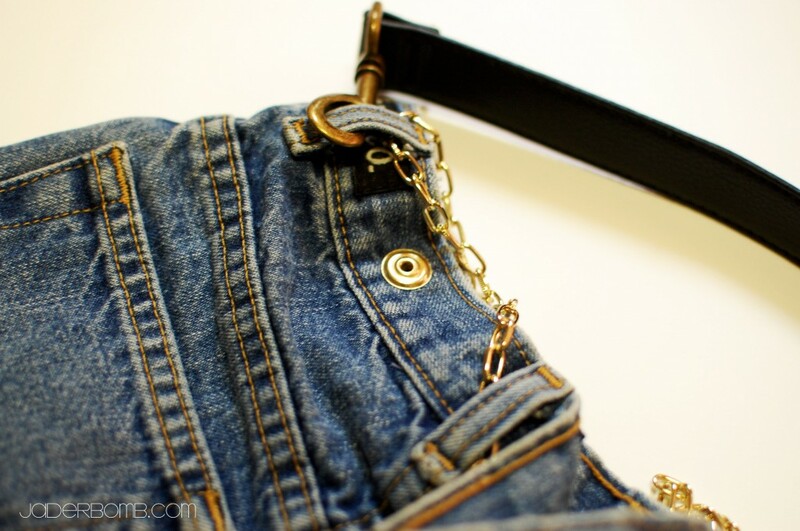 The first thing you will do is cut the pants where you want the bottom of the purse to end. When you are done cutting pin them like I did below. This will secure the material for you. Remember, the longer you cut the deeper the inside of the purse. I am loving this project so much I think I will make a few HOBO bags (with new jeans of course cause we don’t want any honey boo boo smells) and sell them on my ETSY and STORE ENVY shop. What cha think! I think it will save you the time and it’s great Christmas gifts! 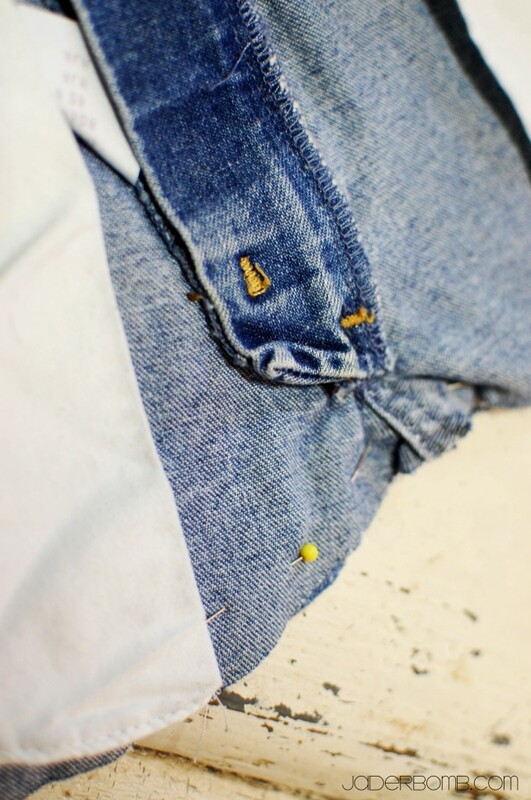 Just a little closer look at how I put the pin through the blue jeans. 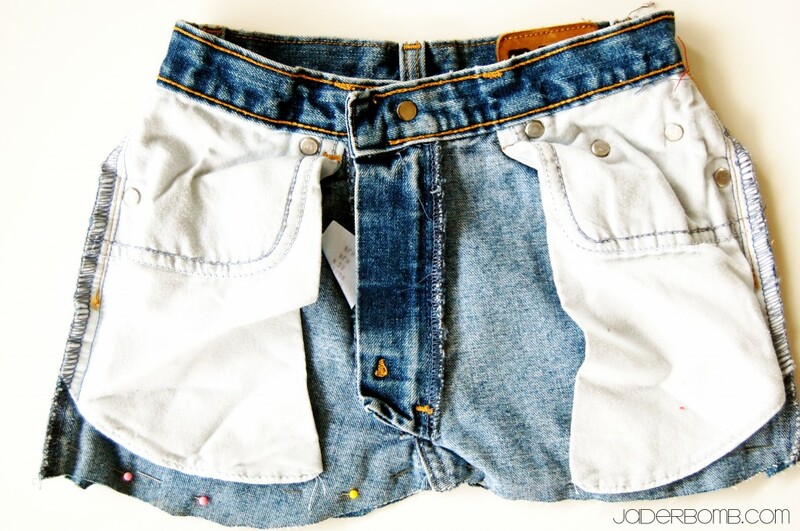 You want to sew the bottom of the blue jeans slowly. I made two passes just to make sure it was secure. 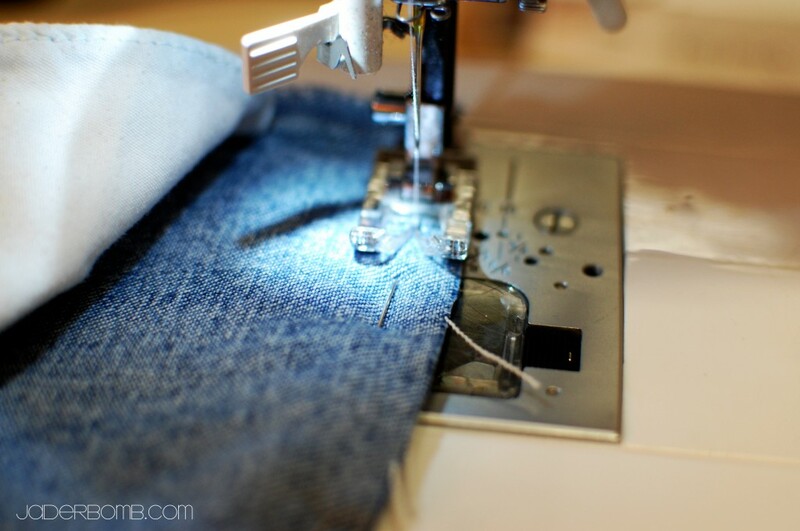 Make sure if you are using a sewing machine for the first time that you take the pins out before you sew in that spot. If you look at the picture below I wait until I am ABOUT to sew the pin until I take it out of my material. When you are done with sewing you might need to take a lil break. You just did some major sewing. I am gonna take a break right now. Now is the time to embellish your new purse. 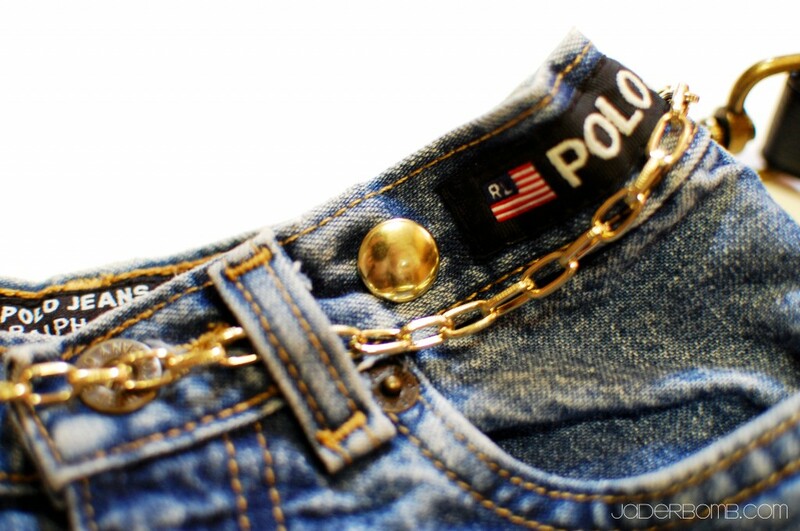 I started by passing a piece of gold chain through the belt loops. 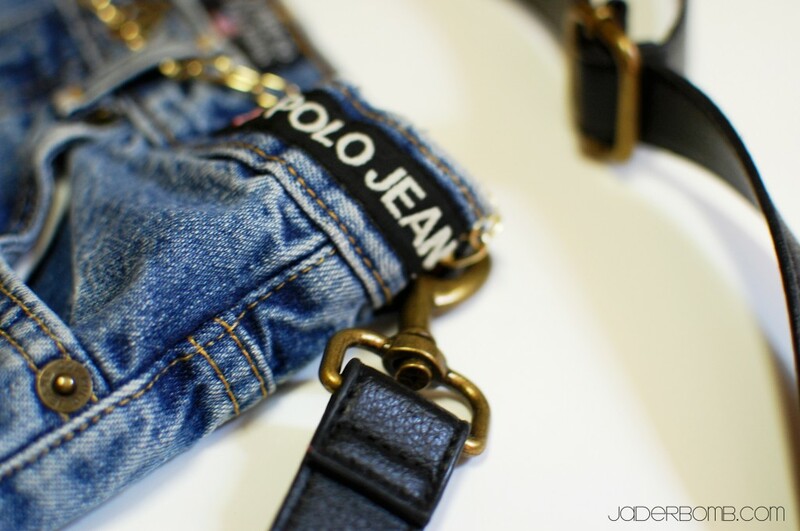 If you don’t like chains, you can actually put a real belt (sheesh that would of been cute, why didn’t I think of that), some fabric or nothing at all. I have a ton of purses that have removable straps so I just stole one off of a purse and clipped it onto the belt loops. I am really loving the way the leather and blue jean look together. In the picture below you will see those two gold snaps that I added. I found when I put things in the purse it kinda opened more and I didn’t like that. I don’t want my goodies falling out now! I used some SNAP FASTENERS for this. You can buy these at any craft store. I bought mine from Michaels Art’s and Crafts. Another close up. This is what the snap looks like from the back. If you are not a fan of GOLD you can get SILVER snap fasteners also. I hope you enjoyed this craft! It was so much fun. You could tie dye your purse, put tons of beads on it, make a strap with fabric, stencil it and so much more! I wanted a clean one, this time. Stay tuned because I will be putting some in my Etsy shop for you to purchase! Can’t wait to see you in the next post! Have you seen my BOOK PAGE CURTAINS? If not you have to check them out. So cuh-yute. Love your pattern but the sound on videos are very low even with my sound turned all the way up. Thanks for the great pictures and the simple easy to follow instructions under each step. Love the idea. Great work. I made one of these a few years ago with tan denim pants, I use a tan and brown belt with it that shrank (actually I grew a few inches) and lined it with some scrap fabric. I get complements on it all the time. I am in the process of making one from a denim skirt my daughter gave me years ago. I like that you can toss it in the laundry with the rest of the wash.
That is so awesome! I love that they are my sons pants when he was a baby considering he is almost 18 years old (noooo) so I will always have this memory! LOVELY BAG….. Your instructions are very clear and easy for anyone to understand. Great job.